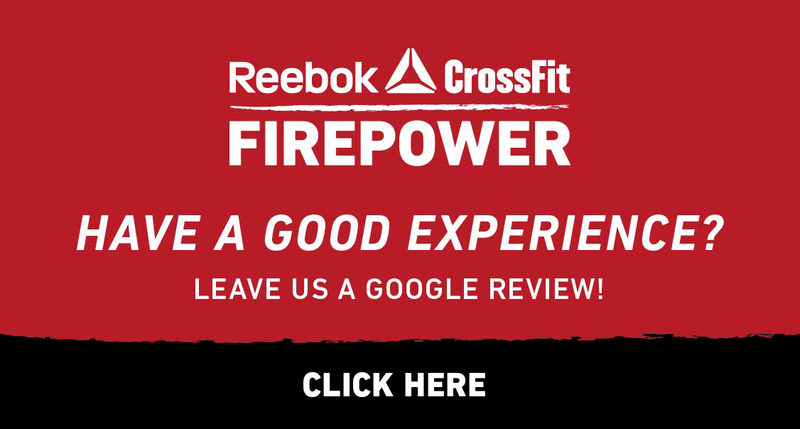 Reebok CrossFit FirePower is a community of fitness. A place where you feel welcome as soon as you walk in the door. A place where you don't have to be in great shape to start. A place where fear and intimidation give way to inspiration and achievements. A place where the once unthinkable becomes a daily routine. A place where you are better tomorrow because of what you were able to do today. Reebok CrossFit FirePower takes pride in making the time that you spend with us the best part of your day. We have a wide range of coaches who specialize in Olympic Lifting, Power Lifting, Boxing, Yoga, Nutrition, 911 Fitness and Sport Specific movements. No matter what your preferred learning style, we have a coach that will work best for you. We do our best to cater to all of our members and make sure that we have something for everybody. By having coaches that specialize in multiple domains, we are able to offer up to 8 different types of classes besides CrossFit. You will notice that when you walk in the door that CrossFit is truly for everybody. Everyday Joe’s, Moms and Dad’s, Tri-Athletes, young athletes, big, small, short or tall. We encourage you to book a complimentary intro session with a coach to see if we are a good fit and how you can get started on your journey to a fitter you! FirePower is the life story of George and Andrea Savard and their twins Samuel and Charly. It was born from our vision to reconnect families through sport and our desire to have our family simply be together. The twins were 6 months old when George had an idea to start a gym of our own. Between bottles, diapers, George’s shifts at the fire department and Andrea’s corporate marketing job, plans got underway. Initial training began inside a high school in Cambridge, Ontario in 2005 as a recreation boxing gym. Within 2 years, Team FirePower had grown into it’s own facility, added a competitive boxing division, and had sent Andrea to the Canadian National Championships following a Provincial title. Using George’s training experience from his pro football days, Team FirePower combined boxing, Olympic lifting and training into their FirePower Hockey program, leading elite OHL and NHL athletes to top fitness testing results. This division gained success from training the entire Kitchener Rangers team, to Chris Gratton, Rich Peverly, Scott Walker, and more, and has been directly involved in many young athletes drafted to the NHL since 2006. 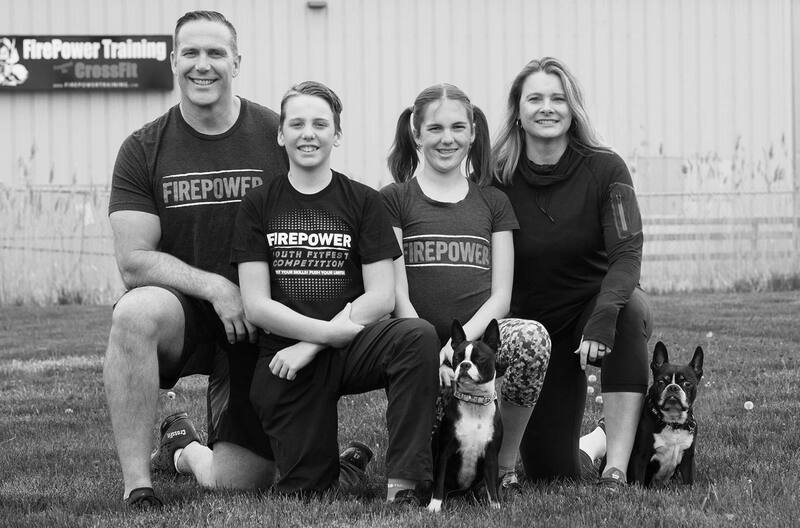 In April 2008, we opened FirePower CrossFit in Milton, Ontario. At the time, it was the largest CrossFit Affiliate in Canada and one of the largest in North America. Through the help of some early adopters and our dedicated training staff we all began spreading the word and the excitement of CrossFit to the town of Milton. With a staff of over 15 people, they are almost all still here today. Passionate about fitness, family and the CrossFit philosophy…chasing virtuosity. FirePower Kids came to life in 2009. 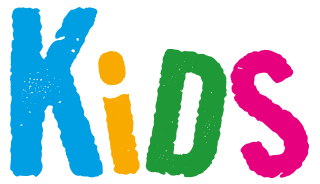 Striving to have families workout together and share a passion for fitness, the kids CrossFit and boxing program brought kids off their ipods and game boys while parents worked out, and started new conversations at the dinner table. Five years later we have seen kids growing up CrossFit, eating healthy, learning the basics of movement for whatever sport they want to play, and for some, finding that CrossFit has become their sport! In September 2011, FirePower entered into an exciting partnership with Reebok to continue our quest for bringing a whole new culture of health fitness to Milton & beyond! We are extremely proud to be part of a growing international CrossFit Family. George and Andrea were invited to represent Canada on the Global Affiliate Board through Reebok International with other RCF affiliates from Korea, Spain, Panama, France, Dubai, and the USA. We invite you to the gym and have a coffee with us. We’ll share our vision to Reconnect Families Through The Sport Of Fitness. It’s worked for ours. Let us help you make it work for yours.